How do health care professionals diagnose hip pain? What types of specialists treat hip pain? Are there any home remedies for hip pain? What is the prognosis of hip pain? Is it possible to prevent hip pain? The hip joint is one the large joints of the body and serves in locomotion as the thigh moves forward and backward. The hip joint also rotates when sitting and with changes of direction when walking. General medicine physicians, including general practitioners, family medicine doctors, and internists, as well as orthopedic surgeons, rheumatologists, and sports medicine specialists treat hip pain. Often physical therapists and rehabilitation physicians are involved in the care of hip pain. Home remedies for hip pain include rest, non-weight-bearing, cold application, and anti-inflammatory medications such as ibuprofen (Motrin and Advil), naproxen (Aleve), and pain medications such as acetaminophen (Tylenol). The prognosis of hip pain depends on the cause and the response to treatment. Most mild strain injuries have a good outlook and resolve rapidly in response to home remedies. Hip pain can be prevented by avoiding injury to the hip joint. This includes sports injury. Sometimes proper conditioning prior to a sports event can prevent injury. Firestein, G.S. Kelley's Textbook of Rheumatology, Ninth Edition. China: Elsevier Saunders, 2012. Hip pain is the sensation of discomfort in or around the hip joint, where the upper end (head) of the thigh bone (femur) fits into the socket of the hip bone. 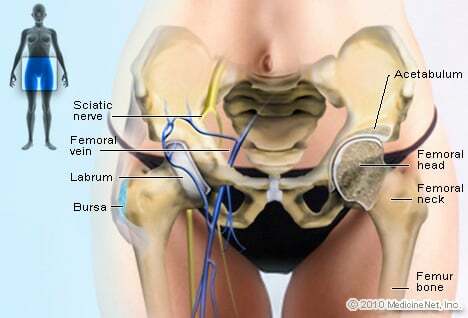 See a picture of the Hip and learn more about the health topic. Iliotibial band syndrome is an overuse injury of the thigh and knee. Symptoms include knee pain and possible swelling. Treatment may involve anti-inflammatory medications, physical therapy, ultrasound, massage, using a foam roller at the site of pain, and the use of orthotics.